God reached down into a home of infidelity and took a young man who was destined to become one of His servants for proclaiming the full gospel message and experience. By God’s appointment young William Freeman Garvin went to live with a godly aunt. While there he attended a Methodist revival and was saved at eighteen. Two years later the Lord appeared to him in a vision and asked him to preach the gospel. The young man drew back, feeling that his lack of education would be a hindrance. At last, however, he yielded, consecrating himself to the service of the master and set out to overcome the obstacles in the path of obedience. For ten years he studied, making his own way except during the first year of preparatory school, when he had the help of a small student loan. He attended Ohio Wesleyan University in Delaware, Ohio; Moody Bible Institute in Chicago; and Lane Theological Seminary of Cincinnati, Ohio. In 1918, he graduated from seminary and ordained to the ministry in the Presbyterian Church, in which he served for 11 years. During that time “the good hand of God” was evident upon his life as He led, step by step, finally bringing him to Tulsa, Oklahoma, as the pastor of a little home mission church. Here he first heard of Pentecostal teaching, living in a community of such church people. When he was told of the baptism of the Holy Spirit, he said, “Yes, I have it; I received that experience when God called me to preach.” And for the first time he felt free to tell of his vision and call. It was in the spring of 1923 that God sent Raymond T. Richey to Tulsa, where for 11 weeks he was marvelously used of God to the salvation of souls and the healing of bodies. During those meetings the pastor of the little Presbyterian church listened for the first time to the message of divine healing and accepted it. Immediately he began to pray for the sick in his own services. God honored His word in delivering the afflicted. Thus the first steps in a life of faith were taken. Mr. Charles Page, a millionaire philanthropist of Sand Springs, a suburb of Tulsa, had donated the use of a lot in the heart of the business district for the erection of the “Richey Tabernacle,” as it was known for years to Tulsans, and had contributed generously to the building fund. He was impressed with the results of the meeting and looked with favor upon the young Presbyterian minister who had the courage of his convictions in acting upon his new-found faith. Mr. Page, who had diabetes, sent for Brother Garvin to pray for him, and God graciously healed him. Just after the close of the first Richey meeting, the Lord revealed the Pentecostal truth to Mrs. Garvin in a remarkable way, but she had said nothing to her husband. “The devil made me believe that my husband would put me out of the home and that I would never again see him and the children if I received this experience,” she said. She tells the story of their struggles in those early days. “On one occasion I found on my husband’s desk the visiting card of a Christian and Missionary Alliance minister. In one corner of the card were the words ‘Have you received the Holy Ghost since ye believed?’ I was startled. I picked up the Bible and turned to that verse. God showed me that this was the experience He meant for all His children to have—it was not a peculiar doctrine of the Pentecostal people. I knew that the baptism of the Holy Ghost was real, speaking in tongues and all. “There was such hunger in my heart that I longed to know all that God’s Word said about the Holy Spirit; so I took a concordance and a Bible and searched for every scripture about the Holy Spirit. Then the hunger left and I forgot all about the matter. “When God sent the next wave of hunger to my heart, I was between two fires. I wanted to be in His will and to have what He wanted to give me. But at the same time I was ambitious for my husband, and I knew that if it should be said of him that his wife was ‘one of them,’ he would be quietly sidetracked in the denomination. “One night, for the first time in my life, I asked my husband to go downstairs with me and pray. The Lord appeared to him again; just as He had done the night He had called him to preach. It was after 3:00 a.m. when we went to bed again. “The following month my husband resigned from the pastorate of the little Presbyterian church, the Lord having definitely led him to begin an independent work. We closed our regular prayer meeting the last night of the old year in the Presbyterian church, then went down to the Richey Tabernacle and had a watch night service. Two received the baptism at that meeting. When Mr. Page spoke to Brother Garvin of building a church for him, he said God had given him a “picture” of it. The two visions were identical. Brother Garvin was overwhelmed and told Mr. Page that he could not let him do this great thing. “The Lord didn’t call me to preach and He didn’t call you to make money. But if I make the money, and you do the preaching, and I furnish the money for a church for you to preach in, that will make me a kind of preacher, won’t it? You surely would not deny me the pleasure of being a preacher in this manner?” said Mr. Page. Then Brother Garvin accepted it as from God. The church was dedicated in June, 1926, with a membership of about 100. The church was given to the congregation with pews and all necessary furnishings—estimated value of $60,000. A very important part of the church work was the missionary program. At the beginning, a Women’s Missionary Society was organized and God wonderfully used and blessed the women of the church as they ventured out in faith to support missionaries. The missionary budget was about $2,200 a year, with approximately 50 active members in the Missionary Society. There are perhaps a score of ministers who were saved and filled with the Spirit in Faith Tabernacle during Brother Garvin’s pastorate. At one time there were three groups of Christ’s Ambassadors. The church had a scholarship fund from which a student was maintained at Central Bible Institute, with paid tuition, board and room—a full scholarship. Faith Tabernacle at “Thirteenth and Trenton,” was the outcome of a vision, a call, and a consecration. There were many stepping-stones in the faith life for this young man out of a home of infidelity, but God found him ever obedient to the heavenly vision. 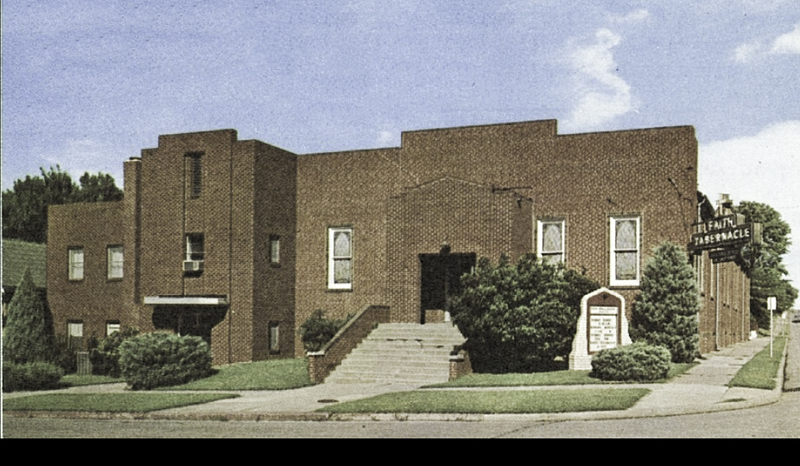 Although Brother Garvin was ordained with the Assemblies of God, Faith Tabernacle was non-denominational until about 1941 when the deed was turned over to him and in turn he turned it over to the church. The decision was made to join the Assemblies of God. The Garvins pastored Faith Tabernacle from 1925 till October 1, 1951. Associate pastor, Tommy Hollingsworth, served as pastor for two and one half years followed by L.J.Underwood, who held the position for six years until June, 1960. Don Mallough came to Faith in August, 1960 and pastored until July 16, 1967. Harry Myers, who came out of Faith Tabernacle, served as pastor for 7 years, from September, 1967 to September, 1974. Under his leadership, arrangements were made to sell the “13th and Trenton” property and construct the present church, completed in 1970. Grady Adcock, who had pastored Lewis Avenue Assembly for the preceding six years, began at Faith in September, 1974 and pastored 12 years until June, 1986. Bill T. Storie followed Brother Adcock in July, 1986, from a successful 17 year pastorate in Beggs, OK, and pastored Faith for over 4 years until November, 1990. Marcus L. Alexander came to Faith February, 1991 after 12 years as the pastor of First Assembly in Muskogee, OK. He pastored Faith until December, 1999. Ernest L. Strong became pastor in April, 2000 and pastored for 3 years. Finally Kelly & Lisa Goins became the pastor in August, 2003 and are the current pastors.